Radiometer ABL 800 Flex PH Blood Gas Analyzer with Flex Q Mixer Attachment . New Life Scientific, Inc. The ABL800 FLEX is a highly accurate blood gas analyzer, which is ideal for high-volume departments. It offers many automated features to help you streamline your work process and reduce errors. This analyzer sets the standard for accuracy, reliability and performance in blood gas testing, measuring any combination of pH, blood gas, electrolyte, oximetry and metabolite parameters. The ABL800 FLEX blood gas analyzer provides high throughput and accuracy compared to lab methods. High throughput and Drop n Go capability for hig-volume needs. 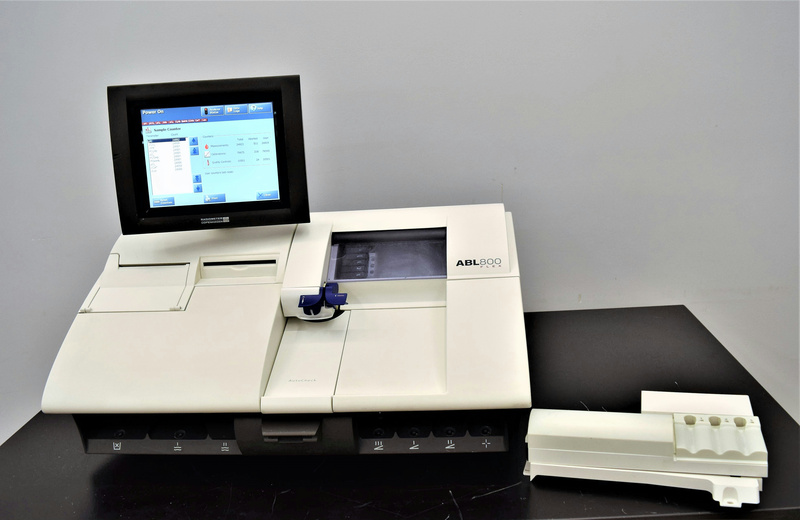 Ideal for medium to high-volume departments, the ABL800 FLEX blood gas analyzer offers reliable automated sample handling and workflow efficiencies. The unique FLEXQ module allows you to automatically analyze up to three blood gas samples in succession. With the ABL800 FLEX analyzers Drop 'n' Go capability, there's no need to wait at the analyzer for patient results. The ABL800 FLEX blood gas analyzer allows you to measure a full panel of up to 18 STAT parameters on the same blood sample. This supports fast diagnosis of critically ill patients and reduces the risks and patient discomfort associated with repeated sampling. This instrument is sold in good working condition, but needing maintenance before actual usage. The power board, video card and all modules were switched from another ABL, to complete this instrument along with hosing and module parts. An error displays, calling for a missing EL/MET module. The old configuration had two and the new configuration only uses one module. The manufacturer will have to come out to set up and certify the unit. They would be able to change the configuration to allow for this change. There is also a software inconsistency which we believe will be fixed the same way. We are including a Flex Q mixer in quotations because we know the new style is called Flex Q but this older version does not have any writing on it. It mixes the sample to make it more homogeneous. Once the mixing is done it is capable of directly inputting the sample in for testing. Unit appears to be working just fine. Can see the pumps run. Will need maintenance performed. It is in good cosmetic condition. Tested, in good cosmetic and working condition.